Standard | Marathon Orthotics, Inc. 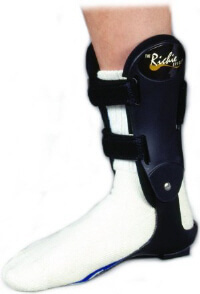 The standard Richie Brace® is a custom ankle foot orthosis which contains a balanced functional foot orthotic attached to a semi-rigid ankle brace. It is designed to apply force both above and below the axis of rotation of the major joints of the foot and ankle (rearfoot complex). The Richie Brace® is designed to control foot and ankle movements in situations where traditional foot orthotics may fail. How does the Richie Brace® work? The orthotic footplate is generally balanced to align the subtalar joint in neutral position, midtarsal joint locked and pronated, and the first ray in a neutral to plantarflexed position. Conformity of the orthotic footplate to the foot of the user encourages optimal positioning and re-direction of ground reaction forces. Rotation of the joints of the rearfoot complex are controlled by controlling TIBIAL ROTATION. Tibial rotation is directly coupled to the talonavicular joint and the subtalar joint. By reducing tibial rotation on the foot, the primary movement of pronation (internal rotation) and inversion ankle sprain (external rotation) is controlled.